Insert the cable into the gripper. Always insert the cable through the pin unless otherwise stated. Adjust the gripper up. When you let go of the gripper it will automatically lock itself on the cable. Press the pin and adjust down. When you press the pin the lock opens and the gripper slides freely up and down the cable. Release the pin to lock the gripper again. A. 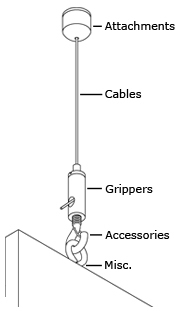 Direction of cable and gripper must be in a straight line. A. The angle of the cable must be in the same direction as the gripper joint. Otherwise the joint may break. Beware of the risk for electrical shock when the cable enters an electrical appliance. Any attempt to manipulate the gripper mechanism voids all our liabilities. Impulses and vibrations can considerably reduce the total strength. Keep oils/fats away from the cable and grippers. Do not paint or coat the cable or grippers. Dust and small particles can clog the gripper mechanism. All products are for indoor use only. Combining other products with original Alem Teknik products voids our responsibility.